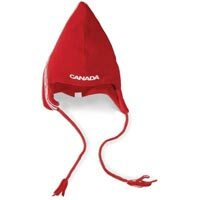 ... because I would love to wear one of these Canadian Olympic team hats. At the opening ceremonies the Canadians wore these great sheepksin ones and the athletes have since been spotted sporting these ultra-cool wool ones with the braided ties (the white wool ones are even nicer). But I've got that big goofy curly hair which looks retarded with a hat. You need sleek short hair to really pull this look off, or at least hair that doesn't sproing out the bottom and sides of headgear like a brillo pad. And now of course, George Stroumboulopoulos has made it impossible for me to even consider wearing one of these hats, since he wore one on The Hour last Thursday while covering the impact of global warming on outdoor rinks (and the Canadian identity). Because now if I tried to wear one, everybody would think that I was trying to emulate George. And while I can think of far worse role models to have than our George in terms of intelligence, personality and integrity, I certainly wouldn't want to rip off his style. Good thing I'm not an Olympic athlete. But I sure am glad that the women on the Canadian hockey team are! Still the reigning Olympic champs, this team! And how about that Hayley Wickenheiser? MVP of the tournament, with a broken hand no less, and she brings her son onto the ice to celebrate the gold medal win with her. Cheers to those Canadian Women! I put your blog as a link on mine. Maybe I should link to all bloggers named Barbara. How many do you think there are? Hey thanks Barbara-in-Montreal! I'm honoured and will return the favour. As far as I know we are the only bloggers in the entire world named Barbara, cause we're special, baby! I love those hats too, and I am not a good hat person either. Once I wore a baseball cap and I was told I looked like Wayne from Wayne's world (and I am a woman). I would totally sport one of those hats! As for hockey, I'm cheering for hometown bronze-medal winning hero Kristin King. hahaha Jacquie (I'm laughing with you, not at you). I hope you gave that person a death-ray stare, that's just brutal. Andy, you could pull off one of those hats, because you have a good hat head. And you MUST support your local heroes, especially that local. How many medals would we have if we had to depend on the men to win them? Ouch zing, Barbara-Montreal! The Canadian women did certainly an outstanding job in these games, but I'm proud of every athlete that took part. Did you watch the finals in men's curling? I've been watching that Newfoundland rink for a few years now and always thought they were champions. 10-4 in the gold medal game! And old Russ Howard to boot. It just doesn't get any better than that. Speaking of curling, Bowser and Blue have a song all about Canadian Curling on the Montreal Souvenirs CD. I have that CD playing in my car this week. But I missed seeing the Olympic curling live. I would have to agree. I like the hat George wore the best, but the others are pretty cool too. Canada are doing rather well these olympics! Barbara-mtl, I saw the Arrogant Worms at the Calgary Folk Fest last summer and they came thisclose to making me pee my pants! They don't sound at all bad musically, but it's the humour in songs such as Jesus' Brother Bob and I am Cow that are their real drawing card. Hi Melissa, and belated welcome (you don't seem to show up on my email notification). I sure wish I could wear a hat like that.